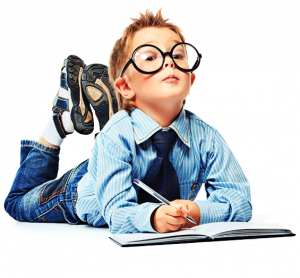 Help your child excel with regular eye exams! Sharp vision is critical for all types of learning, from classroom education to developing good coordination in sports. When kids can’t see crisp and clear, they will often fail at many tasks. This can diminish their confidence and self-esteem in all areas of daily life. To ensure top-notch vision, our eye doctors perform thorough kids eye exams and offer eyeglasses for kids in our eye care offices in Manhattan and Roslyn, NY. Why schedule a kids eye exam if my child has no vision complaints? This is perhaps the most common question we hear from parents who visit our optometry practice in NYC and Roslyn. Essentially, many kids do not complain about vision problems, because they get used to the world as they see it. Yet, undetected or untreated vision conditions can damage your child’s performance across the board. Instead of waiting until a pediatric vision condition gets worse and causes problems, our kids eye care specialists can diagnose it during the early stages. The earlier we diagnose a condition, the earlier we can treat it to prevent complications – before it interferes with the quality of your child’s life. What are common vision problems in kids? According to the College of Optometrists in Vision Development (COVD), research has demonstrated that many kids between 9 to 13 years old have trouble with convergence. This disorder can complicate all parts of education, including learning to read and write. Before the start of every new school year is therefore an ideal time to reserve your kids eye exam! Using a variety of tests and procedures, we will assess all of the above skills to identify or rule out a vision problem. This is the only way to ensure that your child’s eyesight in in good shape! When should I schedule my child’s eye exam? After your kids eye exam, we’ll discuss the results with you. The correction of common vision conditions often involves glasses for either part time or full time wear. Contact lenses are a great way to offer freedom from eyeglasses part-time during sports or on a more full-time basis. Kids as young as 7 years old can be extremely successful with contact lens handling and adaptation. Contact lenses that gently re-shape the eyes overnight (ortho-k) are an excellent option for kids and adolescents who want freedom from eye wear during the day and who additionally might benefit from myopia control. Visual conditions related to focusing lags and deficits in eye coordination may be treated with vision therapy or other methods. Contact our office in Manhattan or Roslyn, NY, for an appointment!